Another song released in 2016, Situka (Rise up), which his supporters sang during protests against his detention, called on young people to rise up and march together against oppression. “When the going gets tough, the tough must get going, especially when leaders become misleaders, and mentors become tormentors, when freedom of expression becomes the target of suppression, opposition becomes our position,” goes the opening line of the track. 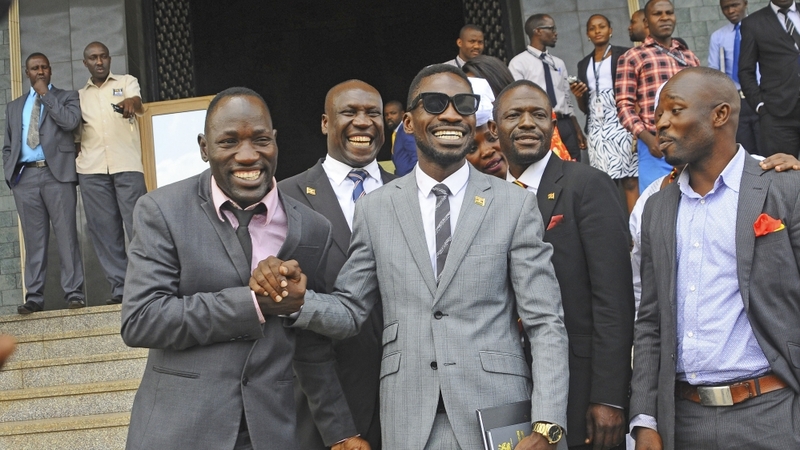 At the height of debates on the constitutional amendment that would later remove the age limit for the president, allowing Museveni to run for yet another re-election, Bobi Wine released Freedom. During one of the parliamentary deliberations, the army stormed parliament and several MPs were assaulted. This was a clear signal that President Museveni had grown impatient about dealing with any opposition. In July this year, Bobi Wine was also instrumental in rallying young people to protest an imposed Social Media Tax which the president initially presented as being intended to deter “gossip”, but was actually a desperate measure trying to curb escalating anti-Museveni sentiment among the young generation. However, it will take a lot more effort on the part of the opposition – beyond Bobi Wine and a grwoing cult-like following – to bring down Museveni’s rule.